Provides a soft yellow light. Use only in fixtures designed for this type and wattage bulb. 24,000 average life hours. Sleeved. Provides a soft yellow light. Use only in fixtures designed for this type and wattage bulb. 24,000 average life hours. Sleeved. 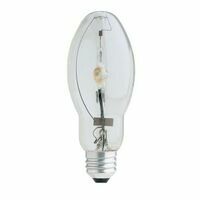 Coated bulb, universal operating position, 4000 K, 45 CRI. 3-4 minutes warm-up time, 24,000 average life hours. Provides a soft yellow light. Use only in fixtures designed for this type and wattage bulb. 24,000 average life hours. 5-7/16" overall length. Boxed. Feit Electric Metal Halide Lamp, MH100/U/MED Designation, 100 W, Ellipsoidal Dimple Bulb, Medium Screw (E26) Base, ED17 Shape, 10000 hr Average Life, 4000 K Color Temperature, Clear Lamp, Pulse Start, M90 Ballast, 5.43 in Length Clear Metal Halide lamp, 175 watts, ED28, with mogul (E39) base. 10,000 average life hours, 4000K, 9.25"H.
High pressure sodium in retail pack. Universal operating positions. 5.43" MOL, 2.13" diameter 21 CRI, 1900K. High pressure sodium in retail pack. Universal operating positions. 5.43" MOL, 2.13" diameter 21 CRI, 1900K. Quartz metal halide lamp, E39 mogul base, ED28 bulb, enclosed fixture rated, universal burn, clear, 4200K, 12,800 lumens, 7500 hours horizontal, 10,000 hours vertical, 132 volts, 175 watts. Feit Electric Metal Halide Lamp, MH175/U/MED Designation, 175 W, Ellipsoidal Dimple Bulb, Medium Screw (E26) Base, ED17 Shape, 10000 hr Average Life, 4000 K Color Temperature, Clear Lamp, 5.43 in Length Long life, bulb averages 18,000 life hours. 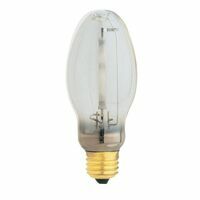 E26 medium base bulb. 5.83" overall length. 120 volt, boxed. Metal halide general lighting clear lamp, universal operating position. 4000K color temperature, 65 CRI. 15,000 horizontal and 20,000 vertical operation average life hours.